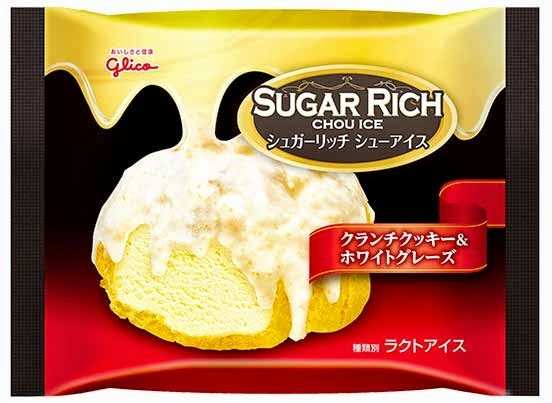 This product's name caught my eye because it is called "sugar rich". I can't imagine, in a day and age when sugar is considered in the same toxic posse as cocaine and heroin, that we would ever see a product promoting itself with such a name in the U.S. It would be like selling meat as being "fat-rich". Nobody wants that. The cornerstones of its appeal are not necessarily in sugar, however. It is promoted for its white glaze and cookie crunch. I'm sure that both are full of sugar, though it should be noted that this is not ice cream despite the appearance. It's what the Japanese call "lacto ice" or ice milk. So, all of the sugar is included, but less fat. This went on sale yesterday (September 23) and retails for 126 yen (about $1.25). It has only 196 calories, but I'm sure it's not especially big since it is stated as being 80 ml. Glico's press release said that the target audience is women in their 20's and 30's who are seeking luxury. I'm guessing the point about that which is not included is that they must bee looking for it on a budget as they aren't paying for higher quality frozen confection.